The Getty Foundation and the Royal Institute for Cultural Heritage (KIK-IRPA, Brussels) announced today the launch of major enhancements to the website ‘Closer to Van Eyck,’ which provides breathtaking details of one of the most important works of art in the world, the Ghent Altarpiece. Enhancements include new images of the work under various stages of conservation treatment, a larger range of technical images, and the ability to see and compare multiple views of the painting at the same time. 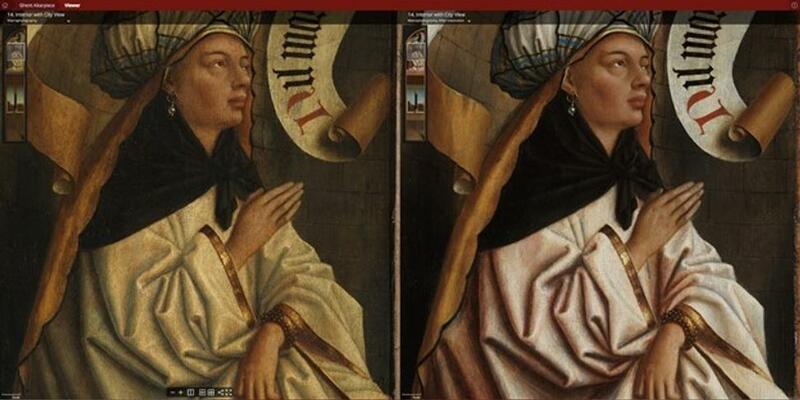 Assembly of digital macrophotographs showing detail from the Ghent Altarpiece. 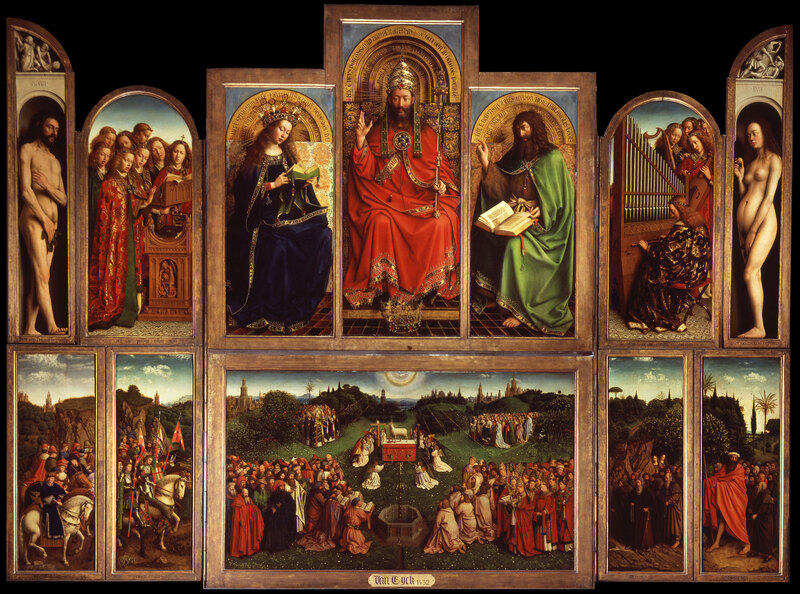 Image from the website Closer to Van Eyck: Rediscovering the Ghent Altarpiece. 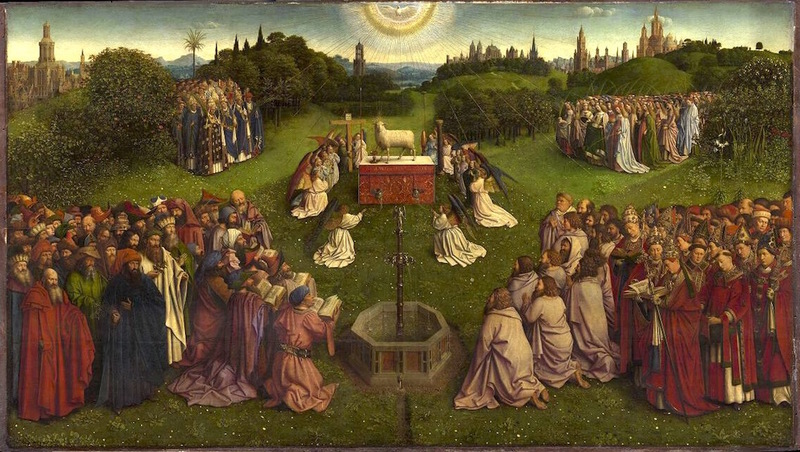 Located at St. Bavo’s cathedral in Ghent, Belgium, The Mystic Lamb of 1432 by Hubert and Jan van Eyck, also known as the Ghent Altarpiece, is a stunning and highly complex painting composed of separate oak panels. 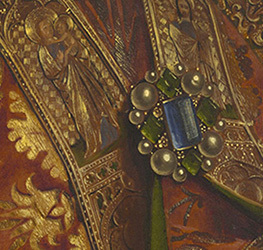 Since 2010, several Getty Foundation grants have supported the conservation planning, examination and training related to the altarpiece as part of its Panel Paintings Initiative. A collaboration among the Flemish government, the Royal Institute for Cultural Heritage and their partners led to the first much-needed conservation treatment of the work in 2010. The panels and frames of the closed altarpiece were treated between 2012 and 2016 and the large-scale campaign now continues with the panels of the lower register of the open altarpiece. The “Closer to Van Eyck” website launched in 2012, and had yet to receive major updates until now. The altarpiece was painstakingly recorded at every step of the conservation process through state-of-the-art photographic and scientific documentation. Thanks to the Royal Institute for Cultural Heritage’s imaging team, digital processing and design led by Frederik Temmermans of Universum Digitalis and the Vrije Universiteit Brussels, and imec’s Department of Electronics and Informatics, the altarpiece can now be viewed online in visible light, infrared, infrared reflectograph, and X-radiograph, with sharper and higher resolution images than ever before. The conservation work also led to the discovery that around 70% of Van Eyck’s original paint layer on the panels of the closed altarpiece had been hidden beneath overpaint for centuries, requiring painstaking removal. The removal of this paint is reflected in the images seen online.